The most important thing a patient, between the ages of 15 and 25, should do for their teeth and overall oral health is to see their dentist regularly at least every six months. At every care visit, the dentist will closely monitor the development of their patient’s wisdom teeth and determine if a referral to an oral surgeon would be advised at that point in time. Sometimes the wisdom teeth are not present at all, other times a person may have 1,2 3, 4 or even more wisdom teeth! When wisdom teeth are present there are cases where they erupt without any issues and there is enough room for them to be accommodated in the oral cavity. In other cases, there is no room for them to erupt or they are impacted in the jaw bone. In these situations, an infection or an episode of pain is highly likely and a referral to the oral surgeon is indicated. Sometimes the wisdom teeth have erupted well but they get decayed and form cavities due to the patient having a lot of difficulty in reaching the back teeth during their daily oral hygiene routine. The posterior area around the cheeks is where food collects the most. In these instances, if the wisdom teeth cannot be restored due to lack of access, meaning, the dentist is unable to reach and restore them, the patient would benefit most from having their wisdom teeth removed. The health of the second molars is sometimes a determining factor on whether to get your wisdom teeth removed or not. In certain cases, the wisdom teeth, also known as third molars, may lie sideways and lean against the second molars causing tooth decay or tooth resorption and negatively affecting the back of the second molars. The age and health of the patient and the proximity of the wisdom teeth to the nerves are also considered. 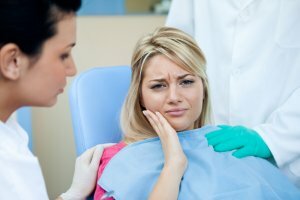 If the patient is suffering from pain caused by wisdom teeth, removal is generally the only solution.